Selina McCarthy, Pat Kiely, Virgin Media Television Ireland, Marcus O’Buachalla, Leinster Rugby and Pat Scully, Oath. Photo: Finbarr O’Rourke. Panelists included Pat Kiely, Virgin Media Television Ireland, Marcus O’Buachalla, Leinster Rugby and Pat Scully from Oath. 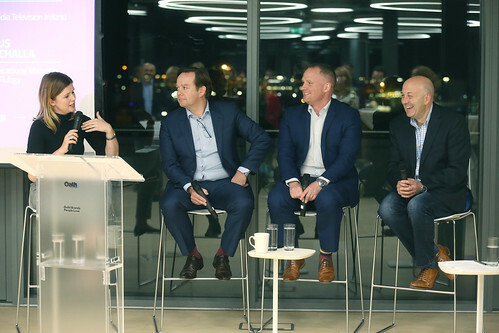 Last night the annual CMO 100 Index was launched at partner Oath’s EMEA HQ with a panel on ‘Brand Love’ featuring a diverse range of communications professionals from major Irish and international brands. MC Selina McCarthy of Reflektor.ie moderated the night, opening with an introduction to Brand Love and what it means for brands before introducing Neil Butler, Commercial Director of Business & Finance who spoke about the CMO 100 Index and its importance in the marketplace. The panel kicked off with Pat Scully from Oath speaking about the 6 pillars of brand building that Oath’s recent market research uncovered. The six pillars are: Exceed expectations, personalise – people want to be targeted as individuals not part of a group, set a voice, Stand out, have a singular message and set a trend. Following on from that Marcus O’Buachalla spoke about the rebranding of Leinster Rugby and how they realised that the success of the brand is not linked to the success of the team but is grown way before. They have accomplished their massive success through ‘rebranding from the ground up’ and developing a new mission statement – that Leinster Rugby is ‘The global standard bearer for Rugby’. Brands that rethink, reinvent and repeat are far more likely to resonate with consumers. That is the insight that top branded companies have. The panel concluded with some questions from the audience. Download full CMO 100 Index here.